The most versatile tip attachment with 3 different textures built in|||ARK's Probe Tip is the most versatile tip attachment for the Z-Vibe®. Its rectangular shape features three different surfaces: bumpy, striated, and smooth. Use it to provide varied sensory input to the gums, palate, cheeks, tongue, and lips. It can also be used to provide targeted tactile cues during oral motor therapy. Measures approximately .4 x .4 x 2.25"
This can vary depending on the mouth size, but typically we recommend them for ages 2.5 years and up. 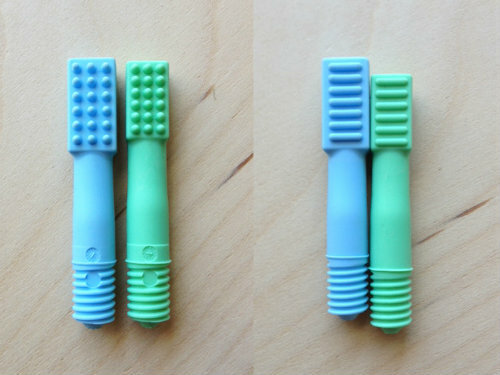 For children under 2.5 years, we recommend the Mini Tip (same design, just smaller in size). How exactly does the Probe Tip compare to the Mini Tip in size? Their overall dimensions are the same. The head of the Probe Tip is larger than the Mini Tip (see the image below for a comparison). The Mini Tips can be found here. This is the tip we put on our z-grabber when my daughter wants to do outer mouth circles. She loves the vibration against her face. Plus the 3 sides of different textures is great sensory input. I've been using my trusty Z-Vibe for years now. The Probe tip is my favorite for sensory oral motor exercises. There are many other tips out there, but I keep coming back to this one. I like to scrape a little food onto the nubby side of the tip to increase acceptance. Works like a charm.